James L. Conway, Charles E. Sellier Jr.
Joshua leads the people of Israel into the Promised Land. A young shepherd boy battles a mighty giant in this riveting tale of courage against over-whelming odds. I liked this Series a lot!!!! I liked this series a lot, because it marked me a lot. It was exhibited by the Globo TV a nights during the month of December in 1979 (in this time I was with only 8 years and today I am with 32), one year after it it was produced. And me I remember that on this first time, of all the 15 exhibited episodes I just attended "Daniel in the hole of the lions. ", episode that had actor Robert Vaughn's participation as king Darius. Then the following year, in 1980, this series was exhibited again by the Globo TV in the "Session of the Afternoon", to the Monday afternoons on Friday, during the week saint, but on this second time in that it was exhibited only 10 of the 15 episodes were exhibited. Two a day, and on Friday, they were exhibited: "Joseph in Egypt" and "Moses." Then in the end of that same year, in the month of December of that same year, in the proximities of Christmas, all the same episodes that had been exhibited in the week saint they were exhibited again and in the same order. Then, the following years this series was exhibited in SBT, again in the Globo TV, and finally in bishop Edir Macedo Record TV. Of all the fifteen episodes of this series, I didn't only like him/it Salomão's" judgement, and "Sanson and Delilah", and the best episodes in my opinion were " THE flood", "The tower of Babel", "Abrahan's Sacrifice", "Sodoma and Gomorra", "Moses", "The Ten Commandments", "Joshua in Jericho", "Daniel in the Hole of the Lions", "David and Goliath" the History of Esther" and "Daniel in the hole of the lions." 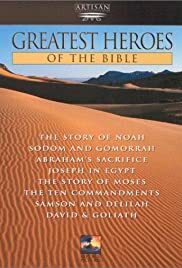 This series doesn't have grandiose sceneries as the epics produced by Hollywood in the decades of 50 and of 60, as "Quo Vadis"(1951), "The Ten Commandments" (1956) and "Ben Hur" (1959) both starred by Charlton Heston, "The Robe" (1952), "King of Kings" (1961), "Greateast History Ever Told" (1965), among many other epic productions. But this is a produced series and driven with mastery and sensibility, the sceneries and his/her special effects are modest, but convincing, as the rays that God throws of the heaven in "The Tower of Babel", "Joshua in Jericho", and "The Ten Commandments" and the opening of the Red Sea in "Moses." The actors' characterizations are in some quite convincing ones, and in other no. For instance, the Philistine generals of "David and Goliah" more they seem noble of Old Rome than Philistines, and the Philistine giant Golias (interpreted by Ted Cassidy) whose helmet is more for the one of Roman centurion than of a Philistine warrior. In short, the episodes were very well produced, but they could have been better elaborated, I say that in relation to the sceneries and to the actors' characterizations. As for the adaptation of the sacred text of the Bible it is very well done and it proceeds with fidelity, in this point the episodes have plenty of emotion. And her soundtrack is also very good. PS: Here in my country (Brazil), this series was exhibited dubbed in the language of here that it is the Portuguese.